Added Saturday 5 p.m. 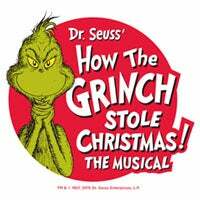 Performance for "Grinch"
Due to popular demand, DPAC is proud to present the Triangle return of Dr. Seuss’ How The Grinch Stole Christmas! The Musical at and now with an added 5 p.m. Saturday matinee on December 3. DPAC beginning November 29 through December 4 as part of the Encore Broadway at DPAC series. Hailed by The New York Times as “100 times better than any bedside story,” this classic holiday musical will enchant adults and children alike. -Seats for the added 5 p.m. Saturday performance will go on sale Saturday, November 19 at 10 a.m. The 2016 production is directed by Matt August and choreographed by Bob Richard, based on the original choreography by John DeLuca and originally created by three-time Tony Award® winning director, Jack O’Brien.